The Mystic Sandhan Valley Trek on 19th Nov 2016 - Mapping Journeys! Sandhan Valley is a beautiful valley situated in the Western Ghats near Ratangad. 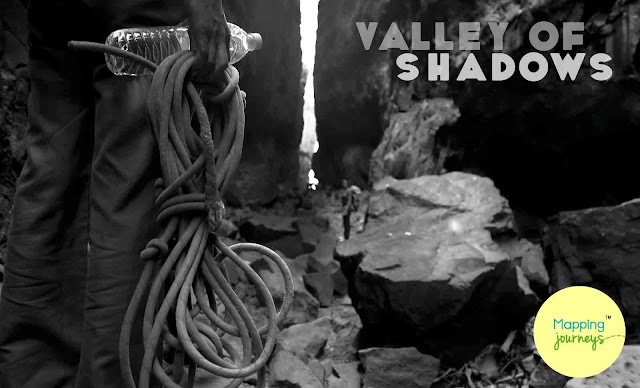 Also known as the Valley Of Shadows (as the sun rays do not reach the insides of the major portion of the valley) , this naturally carved valley is 200 feet deep and approximately 2kms long. Located near beautiful Bhandardara region, it is also surrounded by Alang, Madan, Kulang, Kalsubai, Ratangad and Ajoba forts. During monsoons the valley remains closed for trekking due to rock falls and a number of waterfalls inside the valley. It is a must do trek after monsoons. This trek begins at Kasara and ends at Asangaon station. The entry point of the valley is at a village called Samrad and the valley exits out into a village called Dehene. Sandhan valley is a full descend trek, but the descend is not an easy walk. Completing the trek is more like a solving a boulder puzzle. Throughout the length of the valley we come across boulders ranging in sizes that we need to tackle as we proceed ahead. This trek cannot be done without technical assistance of certified professionals as there are 3 patches where you have to rappel down. A 45ft rappelling patch and 2 more patches where assistance is required only add to the thrill of the exploration. Sandhan is not recommended for people who are not physically fit/active. We highly recommend to check the photos and video link provided below before registering for the trek. Grade : Above Medium with Thrilling Patches. Catch the CST-Kasara train as per the timings mentioned. 01:30 am - Depart to Samrad by a Private Vehicle. 04:00 am - Reach Samrad. Proceed for some rest and breakfast. 07:00 am - Move towards the entry point exploring Sandhan Valley. Rappel down a few patches. Lunch mid way. 05:30 pm - Reach the camping area. Settle after a tiring day followed by talks, food and campfire. End the day nearby a natural pool under the open sky. 06:30 am - Wake Up Call. Breakfast will be provided inside the valley itself. 08:00 am - Start trekking towards Dehene village. 11:00 am - Reach Dehne. Lunch in Dehene. 02:00 pm - Move towards Asangaon. 04:00 pm - Reach Asangaon Station. 07:00 pm - Reach Mumbai(Tentative). Note : The temperature is low in the nights so please come prepared for it by carrying proper clothing/bedding if you are not renting it out from us. Transportation from Kasara to Asangaon. Meals: Day 1: Breakfast and Dinner. Day 2: Breakfast and Lunch. Any item not covered under “inclusions”. Smoking and consumption of alcohol is strictly prohibited. For confirmation of the seat, full amount needs to be deposited prior to the event. Prior to making any payments please confirm about the seat availability.